We’ve previously published funny bingo ads. And since we have come across some funny caption pictures as well from across the web, check them out. 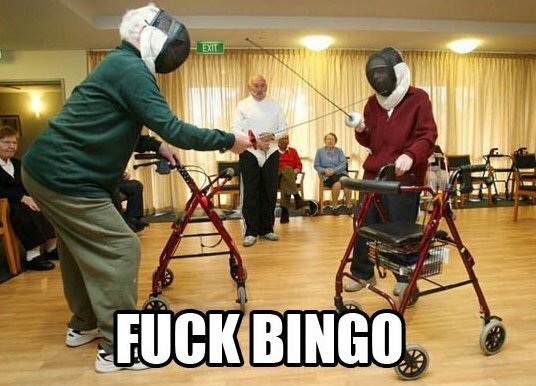 Nowadays a massive amount of people play bingo online, not just silver surfers but younger people as well. I’ve got an account at Paddy Power where I bet on the footy (and did ok when Bradley Wiggins won Sports Personality Of The Year last year!) and they also have a Paddy Power Bingo site. The popularity continues to grow! Despite the shift towards more younger people playing the game for giggles we still love the funny stereotypical caption pictures. Here are some of the best we’ve found. I’ve got a good feeling this lady might win. I want to be in an old peoples home like this. And remember the classic joke. What has 75 balls and screws old ladies? 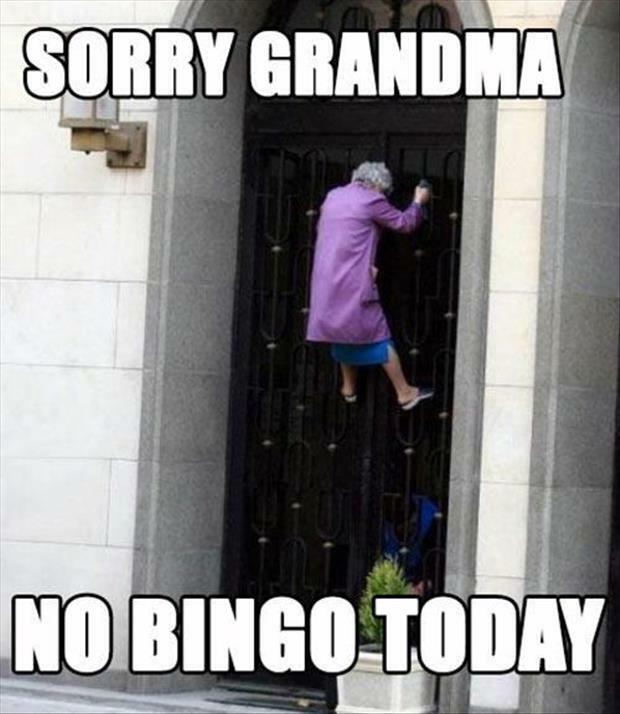 Bingo! Ok we’ve all heard that one before. You can check out more funny photos like these in our caption pictures category. And don’t forget if you have nay other similar goodies yourself to send them in to us and we will take a look. All copyright respective of individual owners. We don’t own the photos and are just sharing them with visitors. I now have a new joke against my grandma! Great pictures, they’re hilarious. 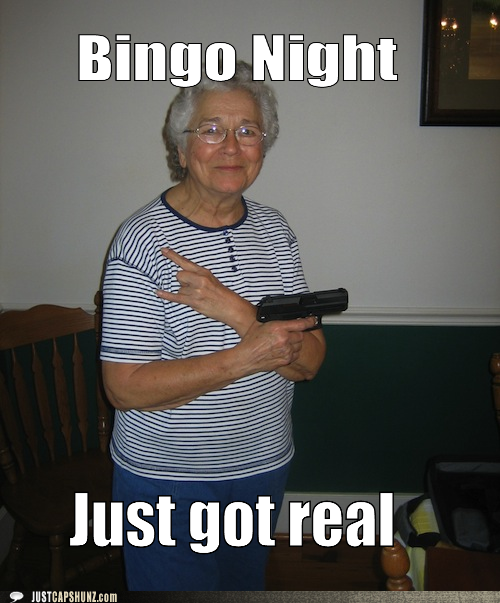 “Bingo Night just got real” left me cracking up. Thanks for the share! Old people pictures are the absolute best. They’ve gotten to the point where they just don’t care anymore and they’ll do whatever they want. 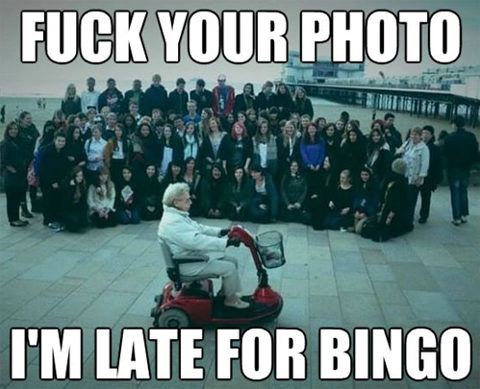 My personally favorite is the “f your photo, I’m late for bingo” pic. Grandma is on a mission! Oddly enough, I had NOT heard that one before. But I’m going to use. A lot. Until my family hates me. More than they do now.